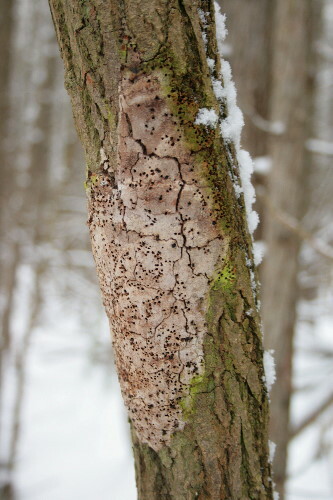 Request for ID – Fungus or egg mass? I have great faith in the power of the nature blogging community to help others with identifications for mystery organisms and objects. Sometimes there are things you come across that you just can’t seem to find the right combination of search terms to produce a result and an ID on the web. You all came through on the comfrey I posted back in the summer. Now I’m asking for your help again; admittedly, this challenge is probably a little more difficult than the wildflower. I found this stuff in our cedar woods at the back of the property. The woods border on a bog/poor-fen, and are themselves rather wet. 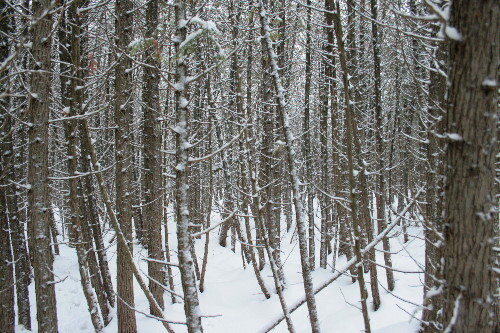 It’s nearly uniformly cedar, but there seem to be one or two tall poplars in the middle. Also mixed in are a few small snags that looked like they were maybe once upon a time also poplars, but were in any case not cedars. I found half a dozen of these small snags, and every single one of them had these brown cakey masses on the sides of the main trunk. I didn’t spot any small trees with this bark pattern that were still alive. They ranged in size from a few inches long to as much as seven or eight. Some were a rich brown, while others were nearly the same colour as the bark. All of them were covered, to some degree, with algae. And all of them had these tiny holes, about 2-3mm in diameter, clustered mostly around the edges and sparingly across the middle. I tried to peel it up to look underneath or assess its texture, but it was woody and firmly attached. My hypothesis was that these were egg masses of some sort of insect. I also considered fungal growths, but then what are the holes? 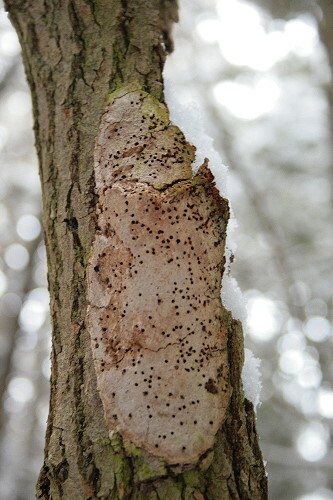 I’m reminded of a post I did in the first couple of weeks of writing this blog, about the bracket fungus Cerrena unicolor, which has a symbiotic relationship with a horntail wasp, whose larvae feed on the fungus’ mycelium in exchange for carrying the fungus’ spores to its next host. The fungus then also uses pheromones to attract an ichneumon wasp that parasitizes the horntail larvae, presumably helping keep the horntails from going crazy and decimating the fungus’ root system. Maybe it is a fungus and there was something like that going on here? Speaking of trees and stuff, the January edition of Festival of the Trees is up at Xenogere. Jason takes us on a walk through the Celebration Tree Grove in Dallas, Texas. I encourage you to head over and join him. Neat find. Egg cases that I’ve had experience with come off easily—this doesn’t seem to be the case here. 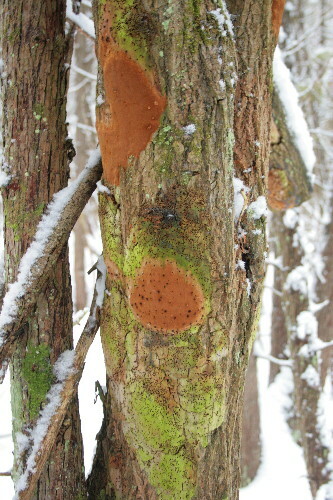 That, and the small holes remind me of insect activity that I’ve seen in some bracket fungi (as you suggest). So I would say fungal. Now what? Not sure. Certainly some kind of fungi that lacks gills & has a sheeting form. Thanks, that’s a good tip to remember, Gavan. I’ll admit to having little experience with egg cases, but some things affixed with silk, like come cocoons, can be very firmly attached to their substrate. They don’t usually go hard like this, though. Thanks, Susannah, that seems to be the consensus. I’ll have to do some poking around and see if I can turn up anything in more detail. I agree that this is most likely a slime mold. 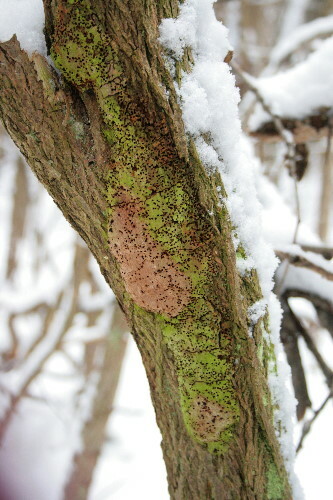 I find a lot of slime mold very similar to this at Blue Jay Barrens, primarily on dead willows. Thanks, Steve. You know, it could’ve been a willow it was on, in fact, though an older one, that probably started growing when the forest was a little younger. I just jumped to the conclusion that it was probably poplar because of the presence of the mature poplars nearby. It is definitely a fungus. And the holes are insect caused. I just can’t tell you what fungus or insect. The exposed is where the spores would come from. I can bug some mycologists for an answer. Thanks, Kirk. I’ll have some leads to follow up on, anyway, which might narrow things down enough to turn something up by Google. If you look hard enough, eventually you can find almost anything, though it does help if you know the right search terms. How about lichen? I’m at the library, so I don’t have my new lichen tomes at hand, but it looks a lot like a couple of lichens in them! I’ll give it another gander tomorrow when I’m at the office. Okay – how about Buellia stillingiana, common button lichen? This one is a pretty good bet, but you can also try Buellia disciformis, the boreal button lichen. Both have the black dots, which are the apothecia, or fruiting bodies. On the former they average 0.4-0.8mm, and on the latter they can be up to 1mm. Give ’em a look on-line. If you can’t find pics, let me know and I’ll take a photo of the pages in the lichen tome and send them along to you. That’s an interesting suggestion, Ellen. Thanks for looking it up in your book! They certainly don’t look much like what I think of as a traditional lichen! They do appear similar. My recollection was that the black dots on the stuff were “innies” rather than “outies” and so probably not fruiting bodies, but I’ll admit the photos don’t really make it clear so I should probably go back and look at them again just to double-check. In any case, a good suggestion to follow up on. This is a wonderful blog, would you be interested in going through an interview concerning just how you developed it? If so e-mail myself! These are most likely spore mass remnants of slime mold aethalia, possibly an Enteridium (splendens?). The cortex has eroded away leaving the spore mass. Then again, there are lots of ‘strange’ fungi (Hypoxylon?). I would guess that if the mass is powdery/loose its a slime mold. The insect tunnels may have been made by Leiodid beetles. right!) however this was a cinch and she seems to be so cute! stores such as 7-11, Target, Wal-Mart, etc.